Natural pink diamonds are considered as one of the most rarest jewels of the world today. Having properties similar to the colorless diamond, these jewels are very much sought after by scientists, archeologists, trade merchants as well as interested buyers, owing to their colorful brilliance and potential importance in quantum computing, magnetism and tectonic studies. Pink colored diamonds have certain light-refractive characteristics that contribute to the dazzling flash of these jewels and a Moh’s hardness rating of 10. The great mystery regarding pink colored diamonds is centered around its color. Usually color occurs in diamonds due to imperfections in its crystal lattice or corresponding disruptions to its structure, which result in a change in the absorptive properties of the diamond and a deflection in the color of emitted light. Blue and yellow colored diamonds are examples of such deviation. While presence of boron impurities make a diamond naturally blue and presence of nitrogen atoms in a diamond make it appear yellow, the defect centers or impurities that lend it a pink tone are not yet known. Scientists at the Argyle mine ( world’s largest mine of pink color diamonds) speculate that the pink color has developed due to seismic shocks which, over the years, distorted the molecular structure of the stone. Spectrometer measurements of the diamonds have failed to find any traces of impurities in their crystal structure so far. Careful observation through electron microscope reveals that these diamonds are not uniformly pink, instead the pink zones alternate with clear, colorless areas. These twin zones of white and pink are suggested to be formed by tectonic shocks, that was possibly the result of volcanic activity or other some other high-pressure underground activity. In order to combat with the high-prices of naturally pink diamonds and market them in bulk, several synthetic alternatives have come up. These include, the pink color enhanced diamonds, man-made synthetic pink diamonds and pink gemstones. 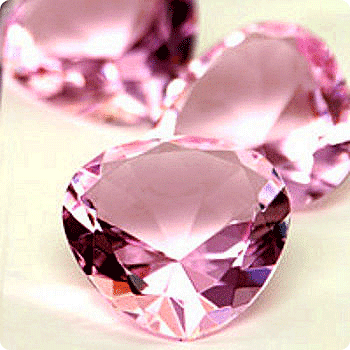 All these are originally colorless diamonds and have been color-treated through high pressure techniques or irradiation to develop a pink shade. 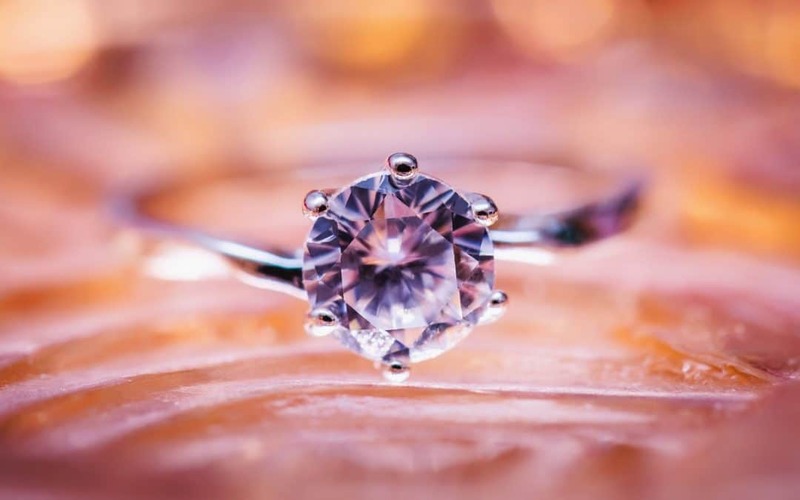 Man-made synthetic diamonds have the exact physical and chemical properties as the naturally pink colored diamonds and find immense use in jewelry-making. Pink colored diamonds have emerged as a matter of geological concern. Their properties and the reasons being their color are being studied in detail as it has become a well-established fact that these very diamonds may in the near future, find tremendous usage in biomedical imaging, quantum computing and decoding of German lock combinations. The most potent reason behind their appreciation is their supposed ability to uncover details regarding the Earth’s history and seismic activity. Geologists believe that mined diamonds are like time capsules and messengers of planet Earth, as they come from several miles below the surface, a place that we can never visit. Since they were formed billions of hears ago, studying their properties may somehow give us a sneak peek back in history, and since pink colored diamonds, are different from other diamonds they might have a different story to tell. Another reason behind their popularity is their dazzling brilliance, which makes them one of the highest-priced and most sought after jewels of the world. Due to their rarity they are sold at auctions at overwhelming costs and preserved in some museums too. 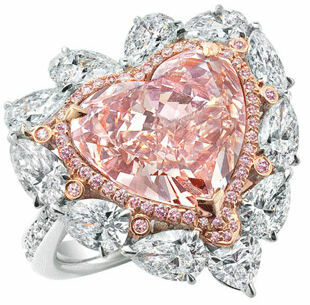 Pink colored diamond rings are truly beautiful to behold. With their luminous intensity and romantic brilliance, they capture the attention of every gentleman who wishes to get the prettiest jewel for his beloved. However the naturally pink colored diamonds command high prices, and some affordable alternatives include man-made synthetic ones, pink gemstones and enhanced colored diamonds. Pink engagement rings range in a varying intensities of colors like light fancy pink,fancy pink, fancy intense pink and fancy vivid pink. Price of the natural diamonds depend upon color, carat size and clarity or cut grades. Synthetic pink colored diamonds are no doubt cheaper but the pink gemstones are price quite high. Synthetic pink colored diamond rings should be purchased from only GIA or IGI certified diamonds. Fancy colored diamonds are mapped, graded as well as weighed in a manner similar to colorless diamonds, with respect to cut and clarity. The only difference between their certification lies in color grade. color grade is specified on the basis of hue, saturation and tone. Colored diamonds that bear authentic certification from the GIA or IGI have excellent cut grade and an eye clarity parameter of S12 or above.